The royal fortress of Chinon was built on a rocky outcrop on a bank overlooking both the River Vienne and the town. Going right back to prehistoric times, the rivers of France formed the major trade routes, and the Vienne joins the fertile plains to the south of the Poitou and the city of Limoges to the thoroughfare of the Loire, thus giving access to the sea at the port of Nantes on the West coast, and to the Île-de-France in the East. Chinon offers an easy crossing point by means of a central island in the Vienne, and the rocks which dominate the shoreline provided not only a natural fortification, but also protection against the annual flooding of the river. It was Theobald I, Count of Blois who first created a stronghold on the Mount of Chinon in the year 954. In the 12th century, Chinon, located in the County of Anjou, at that time independent of the kingdom of France, was one of the main residences of King Henry II (Angevin King and King of England) and served with Poitiers and Bordeaux as an important southern capital of the vast Angevin territories. Henry was probably responsible for the construction of almost all of the massive new chateau – a site over 500 metres long and 75m wide. King Henry died in Chinon castle after his defeat at the hands of his sons Richard and John in a rebellion supported by Philippe Augustus of France. Today a large stone marks the spot where he died in a long gone Chapel. 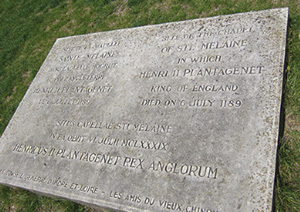 (Below left - Click to enlarge) King Henry, his wife Eleanor of Aquitaine, and their son King Richard the Lionheart were all buried nearby at Fontevraud Abbey. In the year 1308, three high-ranking members of the Knights Templar, including the Grand Master, Jacques du Molay, were incarcerated before their condemnation and execution in Paris. The chateau became a residence of Charles VII, the Dauphin of France in the early 15th century, when Touraine was just about the only territory he still possessed in France, the rest being occupied either by the Burgundians or the English. On March 8 1429, Joan of Arc arrived at the castle, at the beginning of her quest to liberate France from the English. It was here that Joan recognized the Dauphin who had disguised himself amongst his courtiers. This feat was instrumental in persuading the Dauphin to declare himself king and raise an army to liberate France. In 1562 the Huguenots briefly took possession of the chateau and it also became a state prison at the order of Henry IV of France. After that it was largely abandoned until 1793 when, during the wars of the Vendee, the castle was for a while occupied by Vendeens. After this episode however the site was left to decay until Emperor Napoleon III began a partial restoration under the supervision of Prosper Mérimée (the author of the story 'Carmen'). Since 1840, the castle has been designated a "monument historique" and today, Chinon Castle is managed by the Town of Chinon and is a major tourist attraction.